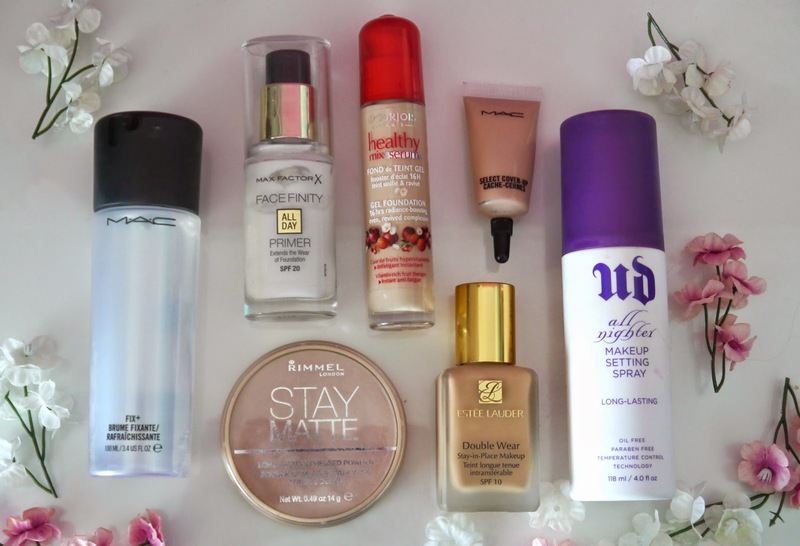 Today I wanted to share what’s in my holiday make up bag, I’ve already been on holiday this year so I’m posting about the items I did take when I went to Tunisia back in April. I really wish I was going on holiday again this summer! If you’re jetting off this summer, I’m incredibly jealous of you, please make room for me in your suitcase! As well as lots of sunscreen, I did pack a fair amount of make up. I admit I did take too much, but I was going for 10 days so I wanted to make sure I packed enough to have a variety of options. I have replaced a few items because they’ve either ran out or I’ve found a better alternative. Most of my make up I took in my suitcase with a few bits in my hand luggage for touch ups, but you have to be careful with airline restrictions. I also took my most likely to break items in my hand luggage as suitcases can get thrown around. I couldn’t face seeing my make up broken! First off we have face prouducts. To prime I just took whatever primer I was using at the time, which is now the Max Factor Facefinity Primer. I find it moisturises the skin as well as being a brilliant primer. I also packed two different foundations, the Bourjois Healthy Mix Serum and Estee Lauder Double Wear, to give me the option for either a lighter coverage or a heavier coverage to wear in the evenings. I originally took MAC Studio Fix Fluid with me, which I had a reaction to so I replaced it with the Estee Lauder Double Wear. As for concealer I stuck with one of my favourites- MAC Select Cover Up in NW20. This stuff will literally cover anything, on a few occasions I used it as my foundation as it’s so lightweight but still gives great coverage, it just doesn’t last as long as my Double Wear. For powders I kept it pretty basic, I just took my Rimmel Stay Matte which is literally a must have for anyone with oily skin. To prolong the wear of my make up I brought my Urban Decay All Nighter Setting Spray. I also took my MAC Fix+ to freshen my skin and cool my face in the heat. Onto cheeks, I kept it pretty basic. I only took one bronzer and highlighter- Nars Laguna and Nars Albatross. 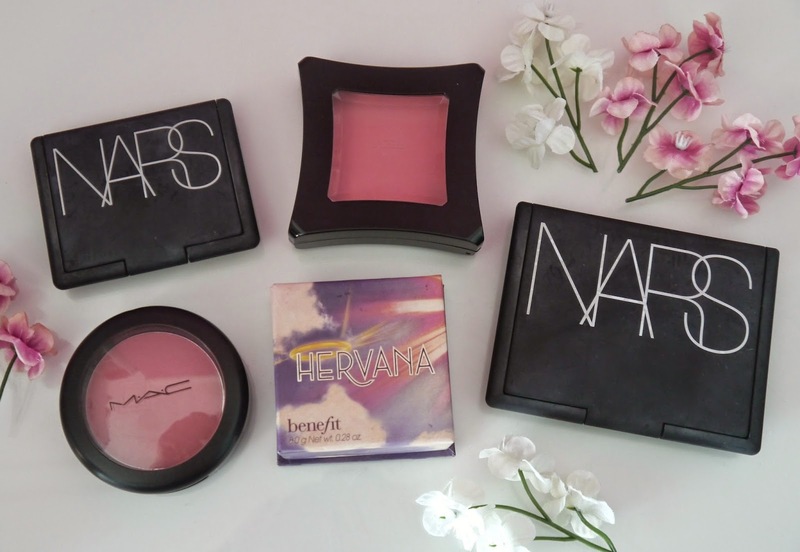 For blush I packed Illamasqua’s Powder Blush in Hussy which is a bright coral-pink, Benefit Hervana which is a peachy rose shade when swirled together, and MAC Fleur Power which is a pinkish coral. 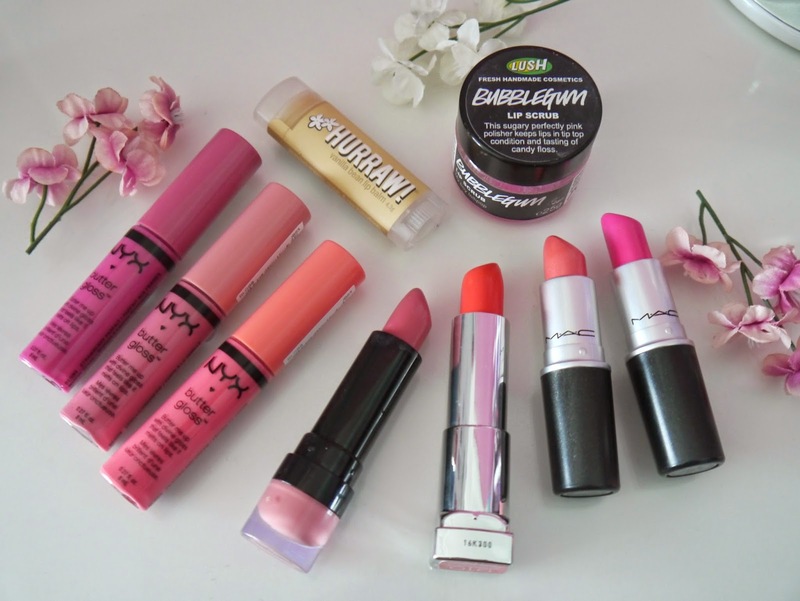 Lipsticks are probably my favourite item make up wise, I have a severe weakness for lipsticks. I managed to control myself and only take these guys, but I could have easily taken a lot more. Starting from left to right I took 3 of my NYX Butter Glosses in Strawberry Parfait, Vanilla Cream Pie & Peaches and Cream. These are perfect just to put on before you head out for the day, they add a subtle hint to the lip and aren’t sticky like most other glosses! As for lipsticks I took my Collection DeLuxe Lipstick in Talullah, Maybelline Color Sensational in Shocking Coral and two of my MAC lipsticks in Sunny Seoul and Candy Yum-Yum. To keep my lips in a smooth condition I packed my Hurraw Vanilla Lip Balm and my Lush Bubblegum Lip Scrub to remove any annoying dry patches. And finally we have eyes. 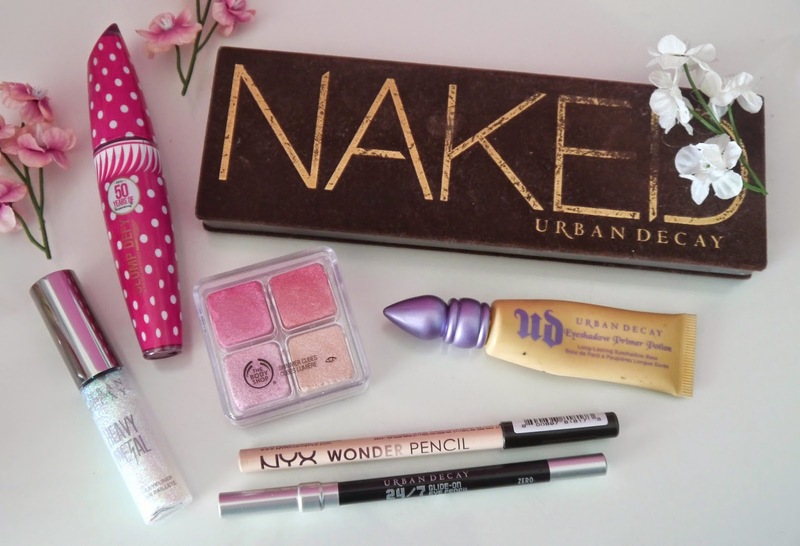 I didn’t take much as I knew most days I’d just chuck on some mascara and be on my way, but for times I wanted to look less like a zombie I’d use my Urban Decay Naked Palette when I wanted to keep it natural and my Body Shop Shimmer Cubes in Hot Pink when I wanted some colour. To prime my eyelids I used my Urban Decay Primer Potion in Eden as I knew my shadows needed all the help they could get in the warm weather. Eye liners I also kept pretty basic, just Urban Decay 24/7 Liner in Zero and the NYX Wonder Pencil in Light on the waterline to brighten my eyes. For nights we went out and I wanted to look a bit more fancy I used my Urban Decay Heavy Metal Glitter Liner in Disortion, which is an iridescent glitter that flashes gold, green, blue and pink. For mascara I just took whatever I was using at the time, which I think was the L’Oreal Miss Manga, but is currently the Max Factor Clump Defy. 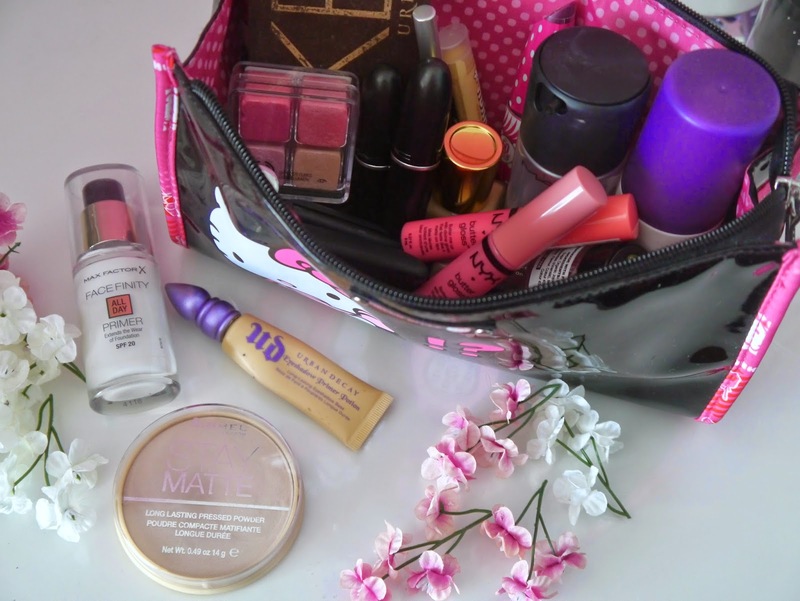 Hope you enjoyed looking into my holiday make up bag, are you going anywhere this year? If so I’m super jealous, have fun!